What if asphalt roads around the world were replaced with modular panels that generate energy during the day and light up at night? Our air would be cleaner and we would spend much less money on fossil fuels. 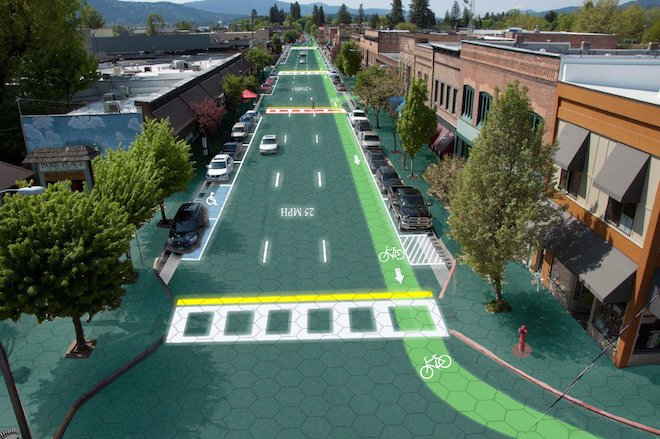 Turns out, thanks in part to a compelling Indiegogo campaign, Solar Roadways may be coming to a highway near you. When global warming first became a real and present danger, years ago, the Solar Roadways team began toying with various ideas to reduce modern society’s dependence on fossil fuels. They turned their attention to roads, and began to wonder whether it would be possible to replace asphalt and concrete roads with modular energy-generating panels that could take a beating. As their ideas evolved, they began to realize that they had hit upon something not only really worthwhile but maybe even feasible. So feasible, in fact, America’s Federal Highway Administration awarded the group a substantial grant to build a prototype that would generate energy and provide light at night with energy-effiient LEDs, manage storm water runoff, and even prevent snow accumulation during winter months in northern latitudes. Phase I of the Solar Roadways project was so successful, the highway administration awarded the group a second round of funding to the tune of $750,000. And then Solar Roadways launched a crowd funding campaign that was so successful, there’s a very strong possibility that one day at least some of us will be driving on roads that generate energy. Seeking one million dollars to hire engineers and other staff to perfect the design and shift from prototype to production, Solar Roadways instead has raised nearly $1.7 million – nearly double their original goal. This success speaks volumes about the power of the crowd, but it also reflects a growing trend – people are investing in renewables because they believe that a future with cleaner skies is possible. 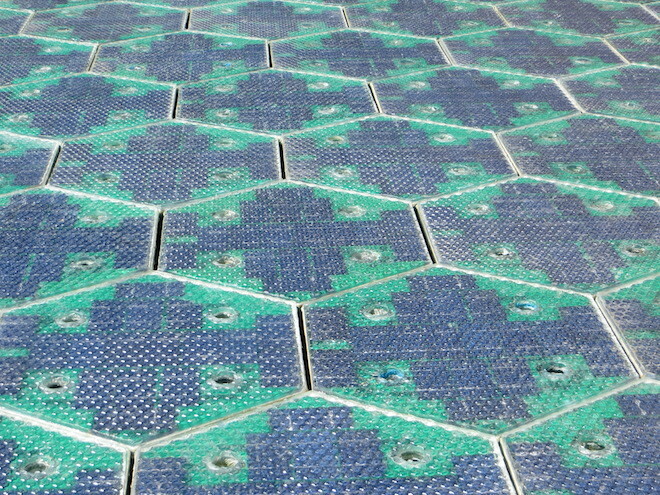 In addition to generating energy such that the hexagonal panels would eventually pay for themselves, the solar tiles could be used to build parking lots, bike pathways and sidewalks. And they could be tweaked to charge electric vehicles. If this happens, fossil-fueled vehicles would no longer be necessary, since electric vehicle could be charged all across the country – wherever the roads are installed. It’s hard not to lament the delay in pursuing such forward thinking ideas as this, a delay caused in large part by the fossil fuel industry. But better late than never right? 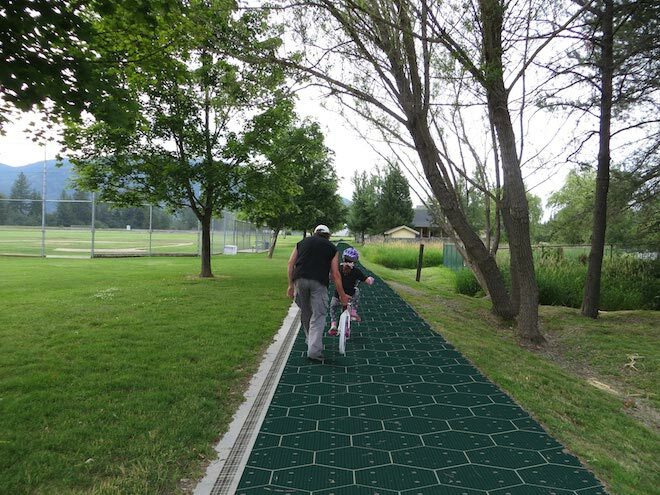 You can still support the campaign – that is, if you would love to see a network of solar roadways in your area. Previous Previous post: Sensibo says it’s already cool. Now make your AC energy smart! Next Next post: Shipping container “cargotecture” not all it’s stacked up to be!